Health practitioners and food enthusiasts, who are pushing for a healthy eating lifestyle, believe that that taste and nutrition doesn’t have to be at the other ends of the table. That is why the Doña Elena Cuisinera Club creatively advocates wholesome and appetizing diets for Filipinos everywhere, through events such as its monthly cooking lessons. “We at the Doña Elena Cuisinera Club believe that one way to change the negative opinion about healthy eating is by showing everyone how to prepare delicious and nutritious everyday food,” says Prof. Luchie Callanta, a UP Senior Lecturer and resident nutritionist of Doña Elena Cuisinera Club. And to further highlight how healthy living can easily be achieved, the Doña Elena Cuisinera Club is sponsoring its first Celebrity Cook-off Challenge that was held on October 24, 2009 at Annabel's Restaurant in Tomas Morato, Quezon City. 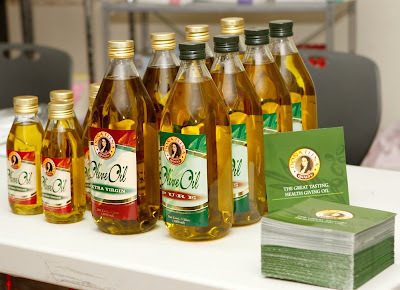 In the competition, celebrities and guests displayed their culinary genius in preparing appetizing Filipino dishes using Doña Elena olive oils. Gladys Reyes and Bernadette Allison had their own groups to compete against each other. By advocating the use of olive oil in every household, the club wants to ease in the nutritious lifestyle into Filipino’s eating habits. With its many healthy benefits, the simple addition of olive oil is significantly beneficial to one’s health. As an oil rich in monounsaturated fat, olive oil is truly set apart from the rest of other oils with its proven anti-inflammatory and anti-hypertensive properties. It has been shown to lower bad cholesterol levels as well as reducing the risk of coronary heart disease, coupled with a healthy and active lifestyle. Aside from this, olive oil is also abundant with polyphenols, a potent antioxidant that scavenges harmful free radicals in the body. For further info, you can log on to www.cuisineraclub.com or call the Doña Elena Cuisinera Club Secretariat at (632) 713-8144.